Marketing and Operations are oftentimes identified as the backbone of any business in any sector providing any product or service. The Marketing and Operations departments are in-charge of knowing what the market wants and how the organization can deliver its expectations, respectively. Thus, making the two departments seamlessly work together is highly indispensable. Unfortunately, due to differences in objectives and expertise, among other factors, Marketing and Operations often find themselves at odds with one another. Despite the fact that there is ideally a great deal of interdependence between the two, Marketing and Operations seldom find the sweet spot in working cooperatively. Business experts suggest that the root cause of the interdepartmental conflict may in fact lie in the very essence of how the two departments are organized and evaluated: Marketing is rewarded for sales growth, while operations is rewarded for cost reduction. Admittedly, each objective is vital for the success of a business, but evaluating each department separately may bring inevitable friction. In doing so, there is real danger that departments will isolate themselves from each other, and pull away en route to fulfilling their mutually exclusive goals, in this case sales growth or cost reduction. Marketing always prefers to have stock in the shelf and has a tendency to overestimate to ensure that items are available. On the other hand, Operations wants to minimize inventory cost and wastage, so it may be inclined to underestimate demand. In the interest of increasing sales, Marketing will accept any order without regard to operational capacity. Marketing prefers variety and “customizability”, while operations oftentimes go for standardization. 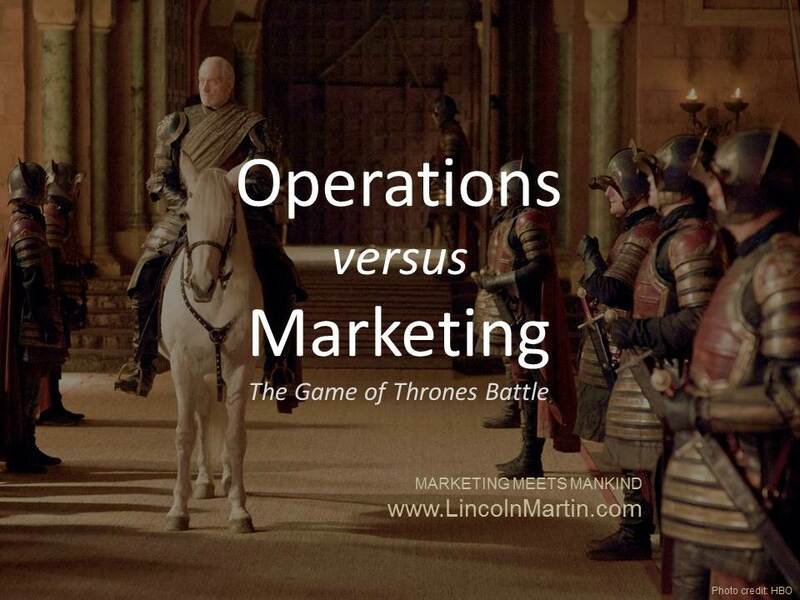 These are just some examples of where Marketing and Operations usually lock horns. To an inexperienced soul, the only reprieve to such heated rivalry may be to pull the departments apart, but the two can only be truly productive when they start working together. A company’s senior management plays a significant role in creating harmony between the two. Company executives have to get their hands dirty and actually communicate a single vision for the organization, instead of hurling disparate functional performance targets that get office departments running towards different directions. They should be able to help their people start thinking outside departmental lines and considering the wider organization in fulfilling their objectives. Their “top-level” position is crucial in making cooperation happen. Senior executives may learn from one of the most marked characters in Game of Thrones. Tywin Lannister once said that “when soldiers lack discipline, the fault lies with their commander.” As company heads, senior managers should take an active role not only in instilling discipline among its staff members, but also in stirring the entire organization onward a single specific goal. When everyone has a clear view of where the business is heading, it will be expected that each member will start working together for the greater good of the organization.